One of the great careers in international sport is coming to a close this weekend. Ski racer Lindsey Vonn’s final run will be Sunday, at the 2019 Alpine World Ski Championships in Are, Sweden — and in typical Vonn fashion, she’ll be bouncing back from a nasty crash to make her farewell race. Some of Vonn’s legacy will involve that toughness and perseverance, fighting back from injury after injury to make it down the mountain one more time. But Vonn’s career will also be remembered for her unparalleled speed and success, as well as the effect that success had on America’s surging ski program — an impact that will probably be felt many years after Vonn’s retirement. To survey the career of Lindsey Vonn is to watch the golden era of United States Alpine skiing take shape. Before Vonn won the FIS World Cup overall championship in 2008, only one American woman (Tamara McKinney) — and three Americans, period (McKinney, Phil Mahre and Bode Miller) — had ever pulled off the feat. Vonn would go on to do it a total of four times as part of a resume that includes a record 82 World Cup event victories, 20 more than any other woman in history. Statistically, Vonn is the most decorated American skier in history, as well as the greatest women’s skier ever. At least, that’s according to the Ski-DB.com “super ranking,” a system that awards points for finishes in World Cup races, the World Championships and the Winter Olympics (since 1966, when the World Cup circuit was originally launched). The ranking puts heavy emphasis on World Cup performance — where Vonn has been at her most dominant, relative to the other competitions tracked — probably because that is the area that has carried the most weight in evaluations of champion skiers and their legacies. What might be most striking about Vonn’s placement atop the list, though, is the standard she has set for American racers. The closest American woman to Vonn is the great Mikaela Shiffrin, at No. 7 overall. The highest-ranking American man is Miller, who checks in at No. 9. Vonn built her No. 1 ranking by dominating two specific disciplines: the downhill and the super-G. She occupies the top spot in the super rankings for both. They are the fastest events — speeds regularly exceed 80 mph — and they require a particular mix of balance, speed and — most especially — courage in order to excel. Vonn has a special knack for pushing away the fear and finding that perfect path. As Vinton writes: “Vonn seems to possess an internal gyroscope that allows her to find the fall line and embrace gravity whenever possible.” Vonn was so quick in the prime of her career that she posted speeds comparable to those of the top male racers, and she expressed the desire to race against men several times over the years. Vonn’s take-no-prisoners approach to racing has led to numerous wins, but it has also led to numerous crashes. She missed the 2014 Winter Olympics and parts of a half-dozen World Cup seasons with injuries that ranged from broken bones to torn ligaments. The cumulative toll on her body — not including Tuesday’s crash — is what convinced Vonn to retire. But she probably would not have been as great without pushing herself past the limits of safety in the name of speed. It’s no coincidence that the U.S. put up a much tougher fight in Alpine during Vonn’s career. 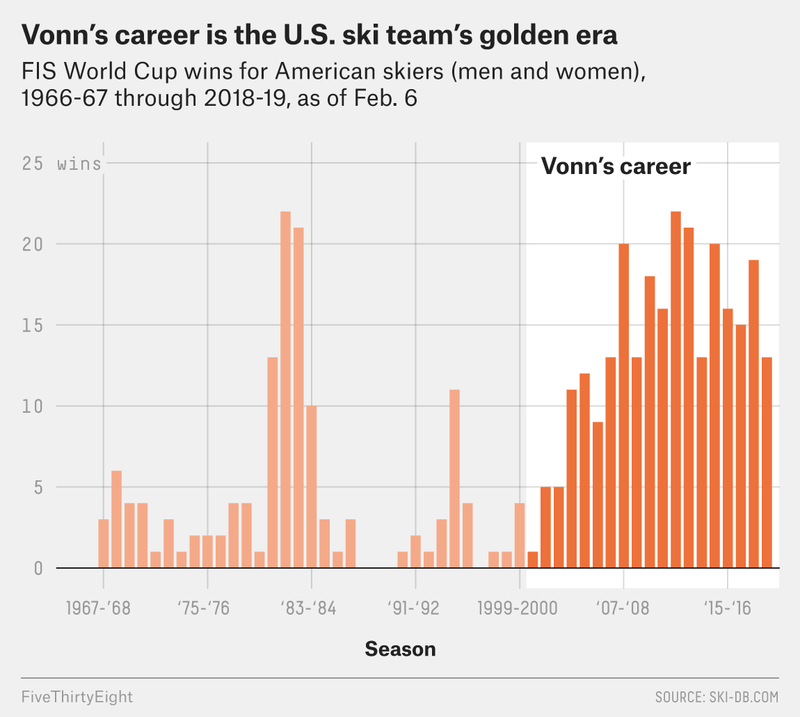 Between men and women, American skiers have won nearly twice as many World Cup races since Vonn’s first full season (2001-02) as they had in the U.S. ski program’s entire previous history combined. The golden age of American skiing has been about more than Vonn, of course. Miller and Ted Ligety emerged around the same time as Vonn, and Vonn credits her friendly rivalry with Julia Mancuso for spurring her to work harder when the two were a promising pair of up-and-coming junior skiers. And it may be only a matter of time before Shiffrin passes Vonn as America’s greatest-ever alpiner. Eleven years Vonn’s junior, Shiffrin has far more wins and World Cup points than Vonn had at the same age, and she is already zooming up lists like the career super ranking at an unbelievable pace. And unlike Vonn, whose signature events are in the dangerous downhill, Shiffrin picks up the majority of her World Cup points in the technically demanding but comparatively safer slalom and giant slalom disciplines, so she might be able to avoid the kinds of injuries that ended Vonn’s career.4 As great as Vonn has been, her days as the GOAT are probably numbered. But that kind of torch-passing is at the essence of the American skiing renaissance. When Vonn was a young girl, an encounter with American gold-medalist Picabo Street at an autograph session changed the course of her life, setting her down a path toward skiing glory. Now that her career is coming to its end, Vonn is leaving U.S. skiing in the hands of a new generation, one spearheaded by Shiffrin. That legacy will last even if the records are broken and the rankings surpassed.